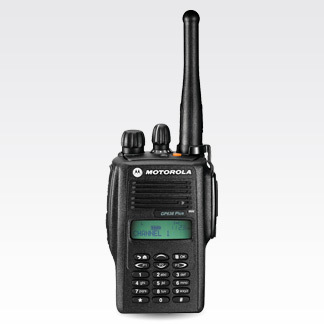 The Motorola GP638 Plus keypad radio, is one of the toughest from Motorola Professional Series to date. Rated IP67* dust-tight and water submersible, the radio is also resistant to knocks and drops. Lightweight and compact, the GP638 Plus has received Factory Mutual (FM) Approval and meets Military Standard (MIL) 810C,D, E and F.
Please check with your local distributor on the availability of this model in your country. communications lines clear during critical missions. such as petrochemical and manufacturing plants. • Supports MDC1200 signalling, Quick Call signalling and DTMF signalling. • Equipped with LCD display, users will be warned on low battery strength through the LDC indicator. • Name tagging with capability to assign 8 different visual caller-ID to 8 specific users/talkgroups. • Easy to navigate menu keys allow users to select the relevant functionalities at their fingertips. calls to other radio system users from one radio. *Dust-tight and water submersible are tested as per criteria in IEC(International Electrontechnical Commission) 60529 IP67.